I picked up this Room 101 305 (robusto) by Camacho Cigars a few days back from Cigar Train. After about 10 trips back and forth in the humidor and not being able to make up my mind, I picked this cigar because of the band. It would be interesting to know how often other people chose cigars this way. So anyway, let's get on to the review. Even through the cellophane the black and silver band creates a nice focal point against the medium brown Habano wrapper. Once it's unwrapped it's even sharper looking. Once you get past the band and actually look at the cigar, you will see that it has a stout, oily wrapper with a bit of tooth. It's nearly seamless and only has a few smaller veins. Pre-light from the foot there were aromas of spicy cedar mixed with rich tobacco. After cutting the cap, from the free cold draw there were again flavor notes of spicy cedar, but now there was a touch of fruit added in. Once the Room 101 305 was toasted and burning the initial flavors were earth, black pepper and oak. As the cigar burned on, a bit of brown sugar, molasses and toast joined in. 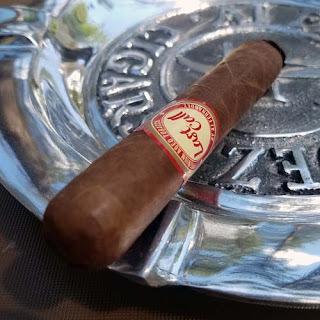 The cigar finished with a flavorful, medium bodied, toast and brown sugar mix. The burn on this cigar was a bit wavy, but never needed any correction, and it left behind a flaky, light gray ash that held for the first third. There was one problem however. I love cigar bands but sometimes they can be a hindrance. With this band, it had to much glue. I didn't have a knife on me to peel away the band, so instead of ditching the last third, I managed to get it off and mangled the remaining wrapper in the process. Overall the Room 101 305 was a pretty good cigar that I will not hesitate to smoke again.